This design has been created in collaboration with Julie Asselin. The cardigan is completely seamless. It is worked from top to bottom. The back is worked in St st until bottom hem, while each front is worked in Moorish Lattice. 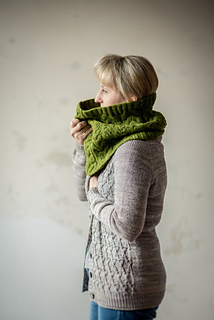 All newly created raglan stitches are incorporated into the front patterning and there are charts with increases for all sizes! After dividing the body from the sleeves, you will shape the body with back darts and work down to ribbed hem. 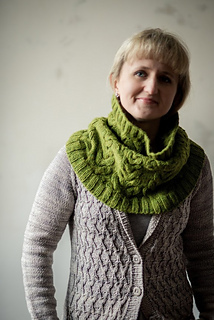 Once you finish the body, you will pick up stitches along the fronts and neck to make a shawl collar. The sleeves are worked last. They are worked in St st in the round and finished with 1x1 Rib. The patterning is only charted! There are 3 language versions: English, Polish (PL) and French (FR). Make sure you download the correct file! Finished chest: 86 (89.5, 94)102.5, 111, 119.5 cm / 34.5 (35.75, 37.5)41, 44.25, 47.75 inches. 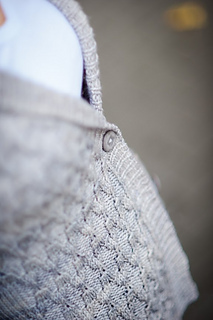 The cardigan is intended to be worn with a small amount of positive ease. Shown in size M on 90 cm / 36” bust. 5 (6, 6)7, 8, 9 skeins of Julie Asselin Leizu Worsted (90% merino, 10% silk; 115g / 200 yards). 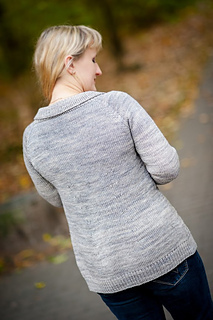 Sample shown in colorway: Birch. 4.5 mm / US #7 circular needle (80 cm / 32” long) and dpns. 4.0 mm / US #6 circular needle (80 cm / 32” long). 3.75 mm / US #5 circular needle (80 cm / 32” long) and dpns. stitch markers, tapestry needle for weaving, stitch holders / scrap yarn, 5 (5, 5)5, 6, 6 buttons (~ 18 mm / .75” in diameter). 18 sts and 24 rows over 10 cm / 4” in St st worked flat with largest needles.